These are the only scrapers that I will use. The handle is molded to the scraper so that it will not seperate. They are easy to clean and do not stain. I can't say enough good things about Pampered Chef's silicone Mix 'n Scrapers. I have used four different sizes of them for almost 10 years and was recently thinking I needed to get some more! 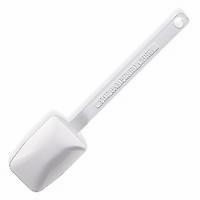 They are awesome for scraping every bit of batter, honey or other sticky ingredients out of bowls or mixing cups. I love this product!